S4GA » How to choose reliable portable lighting for your helipad? How to choose reliable portable lighting for your helipad? Offshore helicopter companies, Medevac, Police, Air Ambulance and Military forces are often expected to operate in remote locations. 24/7 accessibility of remote or improvised helipads is one of the key requirements to support continuity of operations. If You own or use helipad for occasional night operations, this article might be helpful for you. For night operations helipad should be illuminated with an adequate lighting system that provides sufficient visual guidance and redundancy. Remote helipads are usually located in areas where electrical grid is unreliable or unavailable thus portable (battery-powered) helipad lighting is widely used instead of conventional systems. Helipad lighting operations and maintenance require intensified attention as this system is strongly related to pilot safety. Why have we launched SP-102? S4GA designs, manufactures and supplies hybrid and portable airfield ground lighting. We usually supply portable lights for HEMS (helicopter emergency medical services) and rescue services, military and police. Also, our portable lights are used for temporary usage on runways and taxiways. We launched our portable SP-102 lighting unit as a response to market requirements. Our customers expected relatively simple, but compliant lighting unit. Main criteria was: ICAO and FAA compliance, great visibility range coupled with significant operational time. When looking for alternative to SP-102 our customers are usually offered a wide range of products starting from lights designed to illumine construction works to complex conventional lights that require electrical supply. As a result – price range for portable helipad lights starts from 50 USD and sometimes can go as high as 3.000 USD per lamp. Such mix of options can be confusing. 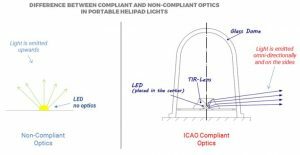 Thus we decided to highlight few critical points that customers should consider when choosing appropriate portable helipad lighting system. 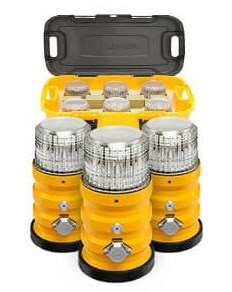 There are plenty of portable lights that one could find on the market. However most of them are not compliant with international aviation requirements. This applies particularly to low-cost products. Here we are talking about light output angles and chromaticity of the light required by ICAO Annex 14. Some of the manufacturers use LEDs without any special optics. It means that when you turn the light on, it will be emitted upwards. 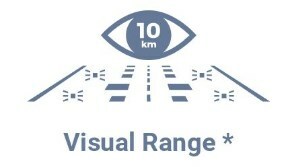 As a result visual range is significantly limited. It also can dazzle the pilot. S4GA use special optics which allows to focus the light at the right angle (related to steep helicopter approach), therefore avoiding dazzling pilot. Another important aspect is chromaticity which means the color of the emitted light. Majority of portable lights are using LED – it is essential to know that LED could emit different shades of light. Aviation regulations specifically require light to be of exact color. For example, white should be more of yellowish color not bluish. In order to provide a pilot with the correct visual guidance. The wrong color could be misleading – for example: in certain portable lights bluish LED are used – this means that white light may appear as blue (runway may look as taxiway) from the longer distances. The same risk applies to other colors as well (red lights might appear as amber). S4GA uses LED of a specific color (green, red, blue) coupled with clear lens in order to achieve required color output. Some customers ask us why we do not use white LED with color filters as it was used before with halogen lights. The reason is that it is virtually impossible to achieve color characteristics required by ICAO or FAA in such configuration. Aeronautical lights are required to be visible from the great distance. Brighter the light is, more power supply it requires, bigger batteries have to be used for that. On the other hand, when you deploy and remove lights from helipad few times a week, you do not want to lift heavy lighting units with big batteries. That is why manufacturers make them compact which usually affects the light intensity thus decreasing visual range. To manage it, S4GA uses special optics that focuses light output only within certain angles and makes it better visible. SP-102 TLOF (green) lights are reported (by helicopter pilots) to be visible from up to 10 km distance. Via individual solar panel connected separately to each lighting unit. This version is the best choice for helipads and airfields located in sunny regions and remote areas with limited access to electricity grid. If you fly in Oceania with high humidity level or land your helicopter on the sea beach near salt water, be sure that your lighting units are made of non-corrosive materials and you will not have to throw them away in few months. We use non-corrosive aluminum body and UV-resistant polycarbonate dome in SP-102. Another indicator you should pay attention to is waterproof rating of lighting you use. An unexpected breakdown in rainy weather can lead to serious and even fatal consequences. IP-65 level is more than enough for such weather conditions, please check it in technical specification. To make the product more attractive and competitive for the customer – some manufacturers decide to provide operating time for flashing mode – not steady mode – because in flashing light mode the battery can operate much longer. Therefore, if you see in specification ‘operating time 50 hours in flashing mode’ you should understand that these lights might operate only 15-30 hours in steady mode. S4GA SP-102 has different operating time according to the application. For instance, TLOF lights will work for up to 36 hours in steady mode, whereas for taxiway lights it is 105 hours (required taxiway light output is significantly lower comparing to TLOF light). Sometimes our clients provide night flights to undisclosed areas for training or other purposes. In this case, they need lighting system to be NVG compatible. Some of the manufacturers offer portable lighting with visible LED only or NVG only. As a result, you need to buy two systems. If you need portable helipad lights that could allow for both types of operations – SP-102 lighting unit is the right product to choose. Usually, when one buys runway edge lights – the same lights cannot be used for taxiway. Why? Because taxiway lights require different optics (both in terms of colour and light output). S4GA does not limit its customers. SP-102 unit offers optical interchangeability. Today you can use SP-102 as temporary runway or helipad lighting and tomorrow it can be converted to operate as an obstruction marking. Suitable optical head would have to be additionally acquired. The cost of optical head is less than 10% of the unit’s price. You may agree or not but the price cannot be a key factor when choosing portable lighting for runway or helipad. One must think first about safety of operations and pilot life and be selective in his choice. We hope this article will help you to find the right portable lighting for your helipad or airfield.